Need to capture audience attention for your content marketing and social media? Then bust the goldfish attention myth. Tap into these 3 forms of audience attention to get marketing delivered, read and acted upon. 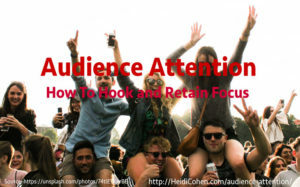 The post Audience Attention: How To Hook And Retain Reader Focus appeared first on Heidi Cohen.